Delegates from most of the 78 Contracting Parties to the Joint Convention on the Safety of Spent Fuel Management and on the Safety of Radioactive Waste Management are holding the sixth review meeting in Vienna to review their peers’ work to fulfil their obligations under the Convention. The Joint Convention, which entered into force in 2001, is the first international legally binding instrument in the field of safety of radioactive waste and spent fuel management. Parties submit national reports on their work under the Convention for review by other Parties in a process that aims to encourage continuous improvement. Review meetings are held every three years. Nine countries – Botswana, Cuba, Jordan, Lesotho, Madagascar, Mexico, Niger, Peru and Serbia – have become parties to the Convention since the previous Review Meeting, held in 2015. 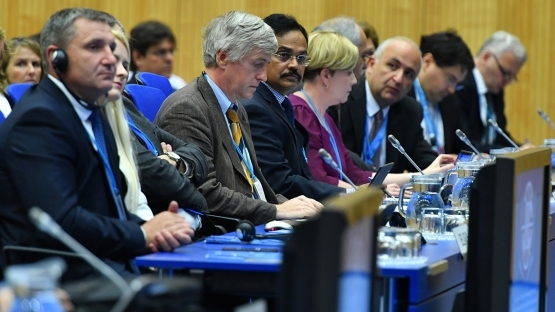 The IAEA provides the secretariat for the meetings of the Contracting Parties. Joint Convention parties have committed to achieving and maintaining a high level of safety in spent fuel and radioactive waste management. The Convention calls on Parties to have effective strategies and defenses against potential hazards at all stages of the management of such materials. “All countries using nuclear technologies have a responsibility to establish and implement comprehensive radioactive waste management strategies, with disposal as their endpoint,” Mr Amano said. He noted that disposal programmes for low-level radioactive waste, which constitutes most of the world’s radioactive waste, had been successfully implemented for decades in many countries, and added that good progress had been made in the geological disposal of high-level waste and spent nuclear fuel declared as waste. During the meeting’s first week, representatives present and discuss their national reports with a view to identify challenges, suggestions, good practices and areas of good performance. The second week’s agenda focuses on the outcomes of the review. Bismark Tyobeka, Chief Executive Officer of South Africa’s National Nuclear Regulator and President of this Joint Convention Review Cycle, highlighted in his opening remarks the vital contribution nuclear technology and radioactive materials provide to modern society. “As we continue to expand our application of nuclear technology, radioactive materials and radioactive sources, one cannot overemphasise the need to ensure the safe management of the spent nuclear fuel and radioactive waste arising from these applications, to assure the protection of persons, property and the environment, and continue to earn the trust of society at large that the continued and expanding applications of nuclear technologies are both safe and sustainable,” he said. The Review Meeting also features two topical sessions, one on recent developments and challenges in the safe management of disused sealed radioactive sources, and a second one on general safety issues, challenges and public acceptance aspects associated with the storage and disposal of higher-level radioactive waste.